Center for Ankle and Foot Care Blogspot: 2 Pods and a Pickleball....3 most common foot and ankle problems andtreatments for our active Pickleball Patients! Since we have a practice right in the heart of the "Pickleball Capital of the World" in The Villages Florida. We decided to learn more about what this sport is all about, so maybe we can help our patients avoid foot and ankle problems and continue to keep playing the sport they love! There are approximately 140 pickleball courts in The Villages. A pickleball court is 1/3 the size of a tennis court and the game itself abides by many of the same rules as tennis. The great part about this sport, I am told, is that it is lower impact and easier on the joints like the hips and knees. But what kind of toll does it take on the feet, that's what I wanted to find out. It is not uncommon at all to drive by a pickleball court in The Villages, and see players that are all 70 plus years old! (and quite frankly moving much better than some 20, 30 and 40 year olds I know) It is a sport that is enjoyed by all age groups and has been steadily growing in popularity. According to the USA Pickleball Association, there are more than 100,000 active pickleball players in the United States. It is not a very expensive sport to pick up and if you live in an area like The Villages, you won't have a hard time finding someone to play with! The story I read about pickleball originating from two dads in Bainbridge Island, Washington that were trying to give their kids something to do after complaining about being bored is classic. But better yet, today it is becoming a household name. I truly love stories like this. To be complete I interviewed some people who play pickleball to see what are the most common injuries to the foot and ankle. How did I find these rockstar interviews? They were patients who also love to play the sport. But the reason they came to visit me was due to pain in their feet or ankles. I would like to first state that I don not believe that in all these cases pickleball was the culprit. However, pickleball did help wrestle up some old injuries and they needed help to figure out how to get better and what to change so they can feel pickleball ready! prolonged period of being on their feet playing pickleball. This is usually a simple fix for the pickleball player as the culprit is shoe gear or lack of support in shoe gear. Wearing the right kind of shoes could make a huge difference and for some people it is as easy as putting a little extra support in the shoe. Also, for those new to the sport or who are just getting back into the swing of things they tend to forget to stretch regularly. Stretching your calf muscles daily could be a foot saver and also prevent another problem like Achilles tendonitis! The largest tendon in your body, the Achilles tendon can also be aggravated by all of the short stopping and starting involved in Pickleball. Stretching daily will ward off this as well. Number two chart topper for my pickleball patients is recurrent ankle sprains. Since, according to the USAPA 70% of the people playing pickleball in this country are 60 years or older, it makes sense that this group may have had a better chance of a couple ankle sprains over the years. Remember, the more active you are the more you open yourself up to injuries over the years. If you have had previous ankle sprain and you want to play pickleball take precautions to avoid future sprains. First, a high top sneaker will provide you with more stability in the ankle. I have a good suggestion for a type a shoe below. 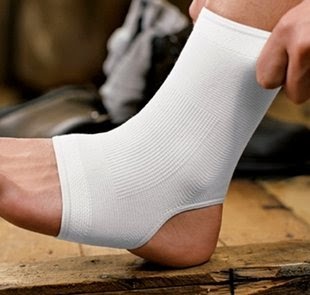 If you already have your lucky pair of pickleball shoes and don't want to buy another pair, start wearing an ankle support, at least like an ACE slip on ankle brace seen here. It is much easier to prevent the injury then treating the sprain. An ankle sprain could keep you off thecourt in a walking cast for 8 weeks up. The number three chart topper that we will talk about today is foot arthritis flare ups in the foot and ankle. Though this is a sport that is less pounding for the knee or hip, there is an awful lot of pivoting and shuffling of the feet. Sometimes this can aggravate old issues and mature joints. Again, this really comes back to what you put on your feet. If your shoes are not supportive enough you need to get an insert to provide extra support or BUY NEW SHOES! But with the arthritis, the key is, in the absence of motion across the joint, the less pain you will experience with wear and tear arthritis. 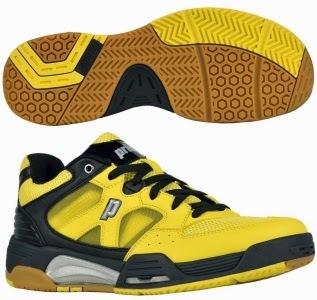 I thought I would start give some advice on the best kind of shoes for a sport like pickleball. Remember, even though it is low impact on the knees and hips, your feet are a different beast. Your feet are taking up most of the little repetitive micro-trauma that pickleball can provide if you do not have the right kind of shoes or support. I see many people in my Villages office who present with heel pain, painful toes and peroneal tendonitis(outside of the ankle strain) on many occasions after several weeks into the start of a new pickleball season (ie now, as many snowbirds are returning to the South). So it is very important to have the right shoe gear on to decrease your possibility of any foot or ankle problems. Let's talk a little more detail of the type of shoe you should look for depending on your foot history. If you are someone who has had frequent ankle sprains and you really want to play pickleball, wear a high top sneaker. Regardless if it is indoor or outdoor pickleball, you need the the extra stability on the outside of your ankle, it could be the difference between playing year round or out for 6 months because of recurrent sprains. The shoe I liked the best for the frequent ankle sprainer was the Prince's NFS (which stands for natural foot shape). This shoe has the higher heel counter in the back which will give the rearfoot more stability. This shoe also has a little more room in the toe box, which is a major plus. Many people who play this sport can be so caught up in it that they could be on the court for 4 plus hours. In the Florida heat, that can equate to a little more swelling of the feet, so the wider toe box is a must, even if you think you have cute narrow feet! 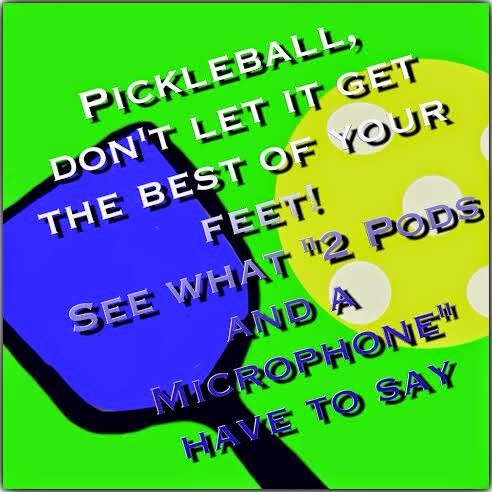 If you are someone who has ever suffered with Plantar Fasciitis or heel pain, pickleball could have you faced with your own set of concerns and aches. Like almost everything in the medical field, prevention is better than having to get treatment. This means your pickleball shoes need more than average support when you have plantar fasciitis. 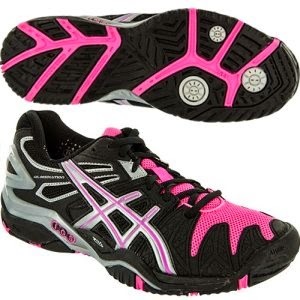 The shoe that I thought was the best for women who have a history of heel pain was the ASICS GEL-Resolution 5. Besides the sleek loom the shoe has a lot to offer the pickleball player who has had heel pain in the past. This is a form fitting shoe that touts the Asics P.H.F. which stands for the personal heel fit system. This shoes is lined with 2 layers of memory foam at the heel counter so the shoe conforms to the heel in the back with out causing any blistering, nice. Also this shoe has mid-sole protection for the plantar fascia. For the men who have experienced plantar fasciitis and who want to reduce their risk of getting it again, I found the Asics Gel Resolution 5, which touts all of the same great features of the womens version above. 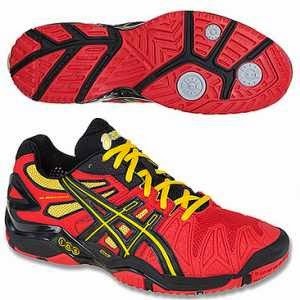 It is a great shoe and will give you the support you need. Extra perk, every time you look at your shoes you will be reminded of Darth Maul by these awesome colors if you are a Star Wars fan! Let's say you are already someone who owns shoes for pickleball but just want a little more support. Well than you probably could get a really great athletic over the counter insert to provide you with this support. I will now shamelessly plug our Center for Ankle and Foot Care over the counter inserts designed by Dr. Henne and myself for plantar fasciitis. It is an athletic inserts and is full length and is a firmer support than you can get at a drug store. There is a break in period that may take you 5 -14 days to feel better with them in the shoes. 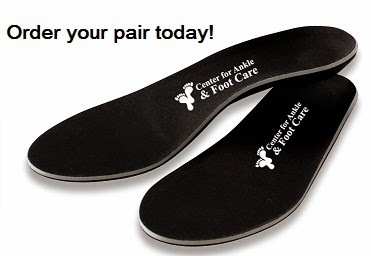 They are available for sale at our webpage at centeranklefootcare.com or click the picture of the orthotic to be brought right to the page to order them. If you are a pickleball player, we salute you for being a part of the coolest sport we have seen come along in along while! If you live in The Villages, Florida and you are having pain in your feet and you play pickleball put your feet in the caring hands of Dr. Michele McGowan or Dr. Tim Henne. They will help you get back on the court faster that you can say pickleball! I'm a runner, and I also have struggled with plantar fasciitis. It's definitely not fun. I really like your idea of wearing more supportive shoes. I've noticed that if I run with good quality shoes, my feet don't bother me as much. Do you have any specific recommendations of shoes that are supportive of your arches? I LOVE this info.It really good. as a recent sufferer of Achilles Tendinitis from the sudden stops and starts in pickle ball I found this article helpful! Tennis shoes area unit created for enjoying lawn tennis, though many of us realize them comfy for each day use. several of the foremost well-liked brands of athletic shoes build lawn tennis footwear, like Nike, Adidas, K-Swiss, Reebok and Wilson. Nice post.Jhansi Orthopaedic Hospital is renowed name for being the best fracture healing hospital in Jhansi at affordable price.For any query visit website. Keep your shoes in great shape with our video collection at Nordstrom.com. Get step-by-step tips for shoe fit, care and cleaning for women and men. Does you provide any boot related services? I just understand your training this really in fact wonderful may very well pick up a considerable amount of advice because of in this case thanks a lot for the purpose of rendering many of these particular advice. This is a really good blog about foot pain. I did change my type of shoes too when I started having foot pain. I also went to see a doctor. Thanks for sharing this. Most minor toe, foot, or ankle problems go away on their own. Home treatment is usually all that is needed to relieve our pain, swelling, and stiffness. This is exactly what I am looking for. Thank you for sharing! Amazing information, If you have a known condition such as rheumatoid arthritis, scleroderma or diabetes, you should discuss foot problem with the best pain management doctors in NYC. You need to treat that foot pain with pain management in NYC .